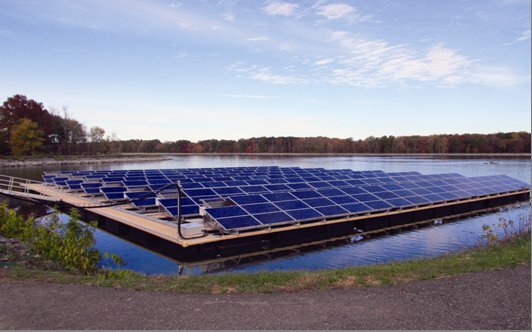 ENERActive Solutions (ENERActive), an independent, full-service energy consulting, engineering, and project development company, recently completed the installation of a 112 kW solar photovoltaic system on a floating racking system atop the reservoir at New Jersey American Water’s (NJAW) Canoe Brook Water Treatment Facility located in Short Hills, NJ. By harnessing the power of the sun, this initiative is anticipated to generate 136,000 kW of energy per year to help the plant treat and pump close to 40 million gallons of water per day to 78,000 homes within the municipalities in Essex, Union, Morris, and Somerset counties. This project was originally initiated at the end of 2009 when ENERActive was contracted by NJAW to conduct solar photovoltaic surveys on sixteen (16) of their water treatment locations. During the study it was determined that since many of their facilities contained large, remote reservoirs used in the water distribution system, these vast surfaces should be utilized to host a “floating” solar photovoltaic system. ENERActive proceeded with the design and development of this innovative approach to energy production by creating a solar array that would float on an open body of water, with the rigor to endure the harsh weather conditions that are prevalent in the North-eastern, United States. ENERActive President and CEO, Dan Weeden added, “This is an ingenious solution to a serious site constraint. Our team was able to formulate and implement a solar project where land and roof space was scarce. These are exactly the types of hand crafted solutions we love to bring to our clients”. Limited floating solar photovoltaic systems have been installed in warm-weather climates. These systems, however, have previously not been able to survive freeze/thaw weather cycles. ENERActive was able to include a specialized docking system (manufactured by Poralu Marine), that contained floats filled with polystyrene, allowing them to withstand severe weather conditions. Even in the case of an unlikely puncture or failure, they will still float and can easily be maintained. This coupled with the creative underwater anchoring system (manufactured by Seaflex, Inc.) provided the stability needed for optimal performance of the solar array. Over the next year, New Jersey American Water and ENERActive will evaluate the performance of the array and the extent of maintenance required, and after one year of operation determine how they can expand the potential for this type of unique renewable energy system. New Jersey American Water installed its first ground-mounted solar facility in 2005 and has added several since that time. They are currently installing three additional solar arrays with ENERActive, however, this innovative floating system is a ground-breaking step for them. The State of New Jersey has a progressive renewable energy program which provides incentives for alternative power projects and creates jobs. The 2009 Federal ARRA tax incentives (Stimulus Plan) along with the State of New Jersey SREC program make the installation of solar facilities in this state an attractive investment with a reasonable payback. ENERActive Solutions is an independent, full service energy engineering and project development company specializing in the analysis, design, development, and installation of energy efficiency and building infrastructure projects. ENERActive leverages both traditional demand side strategies and innovative supply side initiatives to ensure optimum facility performance and lower operating costs.